David Fitzpatrick is a gifted writer who ultimately overcomes the soul-crushing effects of severe mental illness. 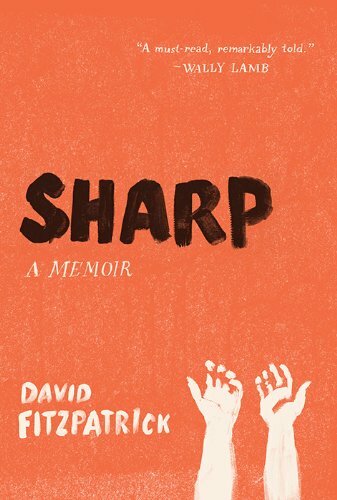 His memoir, Sharp, is, however, not a pleasant read. In fact there are moments in this memoir that are nothing short of horrific. After all, how could a book about a young man who slowly becomes so gravely ill that the only pleasure he experiences is slicing and carving into his own body not be horrific? As with most memoirs written by those with mental illness, Fitzpatrick begins with his childhood and ends with his recovery. If you didn’t know recovery was coming, this book would basically be unreadable. Memoirs can be a little tricky. There must be a balance. Not too grandiose, not too self-flagellating, not too narcissistic. Fitzpatrick does well with this. Most memoirs appear to be cathartic for the authors. The best memoirs elicit empathy, while taking the reader along on that cathartic journey. They also relate a good story—a story that deepens and exemplifies the human experience. This sort of thing is repeated throughout the book. And although it’s important to understand how very ill he was and the sensation his cutting gave him, the emphasis on this joyful misery is his undoing—in both the book and so many years of his life. Not only does Fitzpatrick devote an enormous amount of “memoir time” describing his self-mutilation, but also blaming the cruelty of his brother and his college roommates for his downfall. What he really should have emphasized is his unlucky genetics. His family tree is dotted with severe mental illness. Even the suggestion that his poor treatment as a child by his brother and being the brunt of childish college pranks was the cause of his severe mental illness does an injustice to all those who have suffered from these no-fault neurobiological illnesses, and to their friends and family. Undoubtedly his poor treatment was a huge factor in Fitzpatrick’s lack of self-esteem, and this poor self-esteem significantly delayed his recovery; but too many pages were devoted to rehashing figurative and literal old scars while laying too much blame. What would have made this memoir shine is full acceptance of his illness as an illness and stressing what it took and what it felt like to recover. As stated earlier, Mr. Fitzpatrick is a skillful writer. If only he’d used those skills trying to unravel the mystery of his recovery and the key to the sustainability of his present wellness. “For those struggling with mental illness,” Fitzpatrick says, “I have no easy answers.” “—try to surround yourself with the best psychiatrist and therapist you can find.” “Don’t’ ever give up.” “Stop.” “Ask for help.” “People get better.” This is pretty much the only clear take-home messages he directly offers. Sharp does prove that even when dealing with the most dire and insidious of illnesses recovery is possible; and that four letter word, HOPE, is something to always hold on to. This take-home message is incredibly important and that alone may be reason enough to read this book. For those who want to understand the inner workings of a self-mutilator, Sharp is an excellent read. For those who are looking for a map to a smoother road to recovery, it might be best to look elsewhere. Perhaps Mr. Fitzpatrick will use his exceptional writing skills to offer up a little more recovery in his next book.